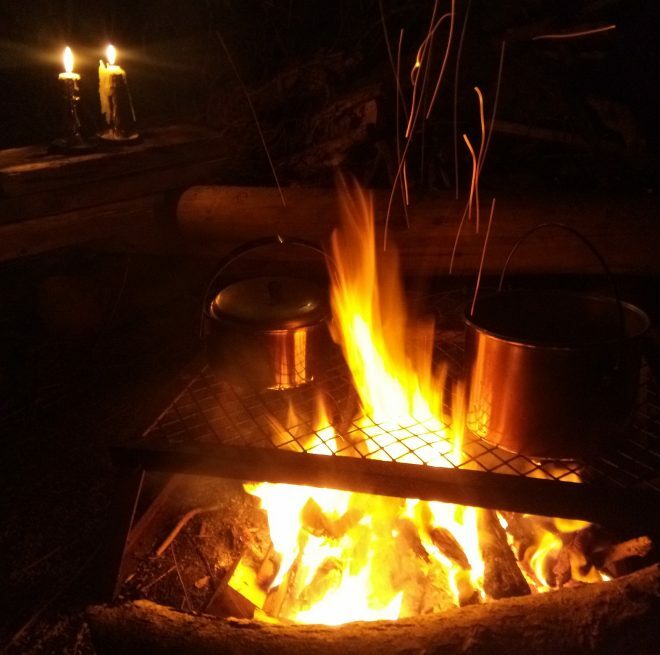 I can’t decide if it’s my romantic or eccentric nature that has made me come up the garden to write this blog by fire and candlelight but I’ve been on the hunt recently to find interesting places to write letters from and it’s the most perfect starry night not to be missed, plus with the fire blazing it’s actually pretty warm. There’s a vegetable stew cooking nicely and Van Morrison is singing quietly in the corner. I mean via a CD player from the shed not actually Van the Man (although how cool would that be). I’ve fashioned a shelf from some old planks and balanced two candles on there and the night’s so still I can hear the waves breaking on the shore over a mile away. 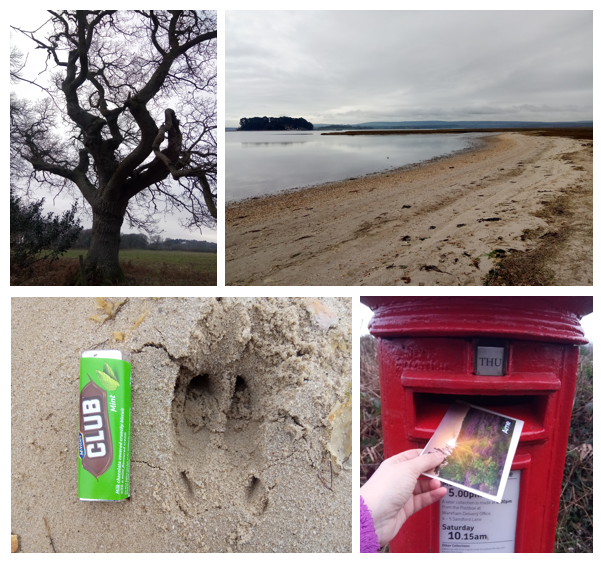 I wanted to tell you about the lovely time I’ve been having this past month visiting lots of beauty spots and historic houses just to see what it would be like to sit there for a few moments and write someone a letter. I’m hoping it might inspire you to do the same. 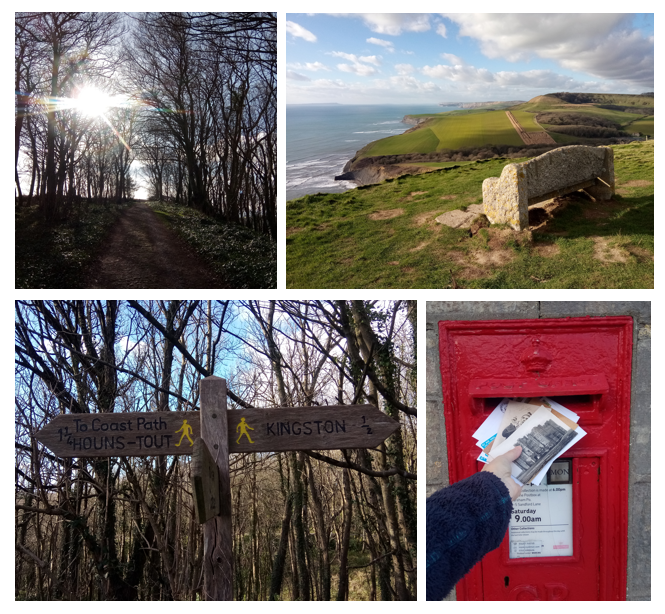 Also part of the motivation was I needed to get away from a screen, as well as do some exercise, and I love so many of the places round here that it’s been great to take the opportunity to revisit them with a slightly different objective. 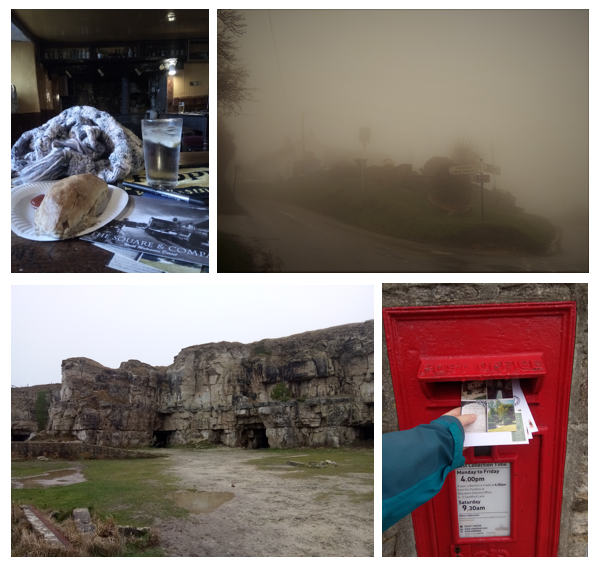 In truth I wasn’t sure I wanted to go on my own, being more gregarious than not, but decided to see the little trips as mini-solo-adventures. As it was it felt really exciting with my plastic wallet full of postcards and stamps and envelopes, trotting out to Houns-Tout on the Jurassic Coast, or sitting in the dunes at Studland, or scrambling down to Dancing Ledge, or persuading the staff at Hardy’s Cottage to let me in (even though it was closed) to write a letter to Mr Boldwood (long story). In fact they didn’t take much persuading. 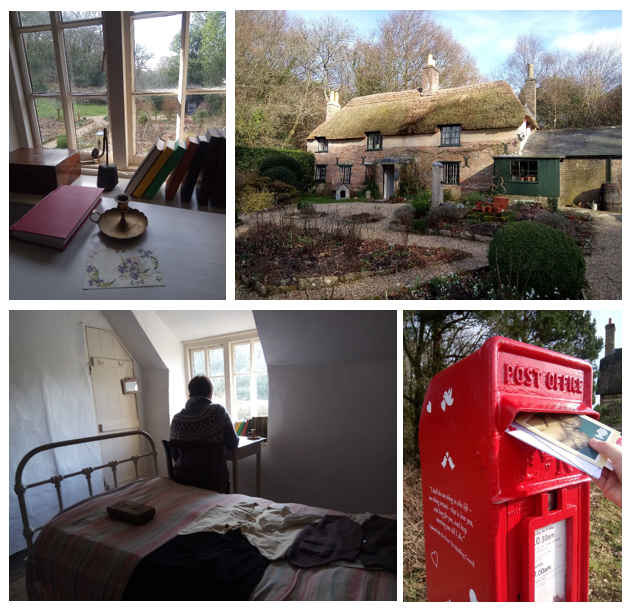 They were very sweet and seemed to completely understand where I was coming from (it was the day before Valentine’s Day) and let me sit in the very spot that Thomas Hardy wrote Far from the Madding Crowd. Now that really did feel very romantic (and eccentric). It really brought home the importance of time and space, not only in that moment but in terms of where all letters are written from. I love it when I know the hour and location of a letter. It really sets the scene and helps me see the writer sitting there. Amazingly as well, passers-by or other visitors were really interested in what I was up to. I was expecting funny looks but I’ve had the loveliest chats with people all about handwritten letters and how special they are. I think that’s why I’m also interested in the places that other people write their letters from. 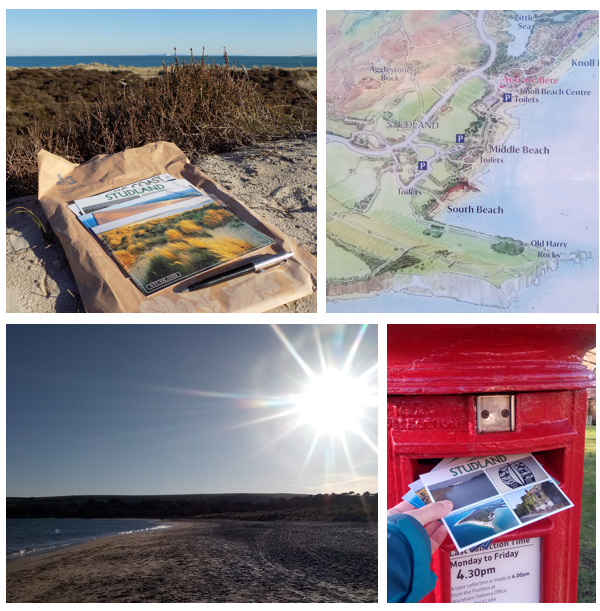 I thought it would be fun for people to send in photos of quirky places they have written letters, to put in the Gallery. It adds a different dimension if you know a letter is written halfway up Everest or from the Antarctica. Not that I have any from there, or that it needs to be that extreme. The dining room table is good enough, or on a bus, in a cafe, or down the park. 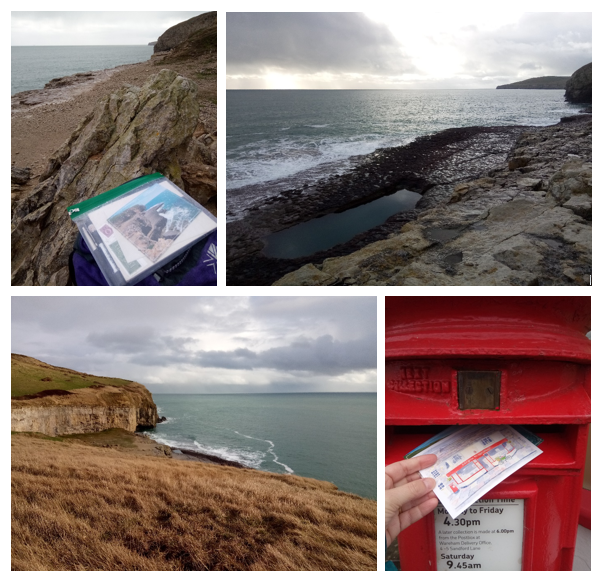 My little excursions have made me to want to write letters from all sorts of other places too, like, I don’t know, on the London Eye, or from a museum, perhaps on top of Snowdon, on a plane, from Windsor Castle, or the Liver Building. Those were just off the top of my head – there’s so many places to choose from.